Eva, known on Etsy as LadyArtisan, sent this wonderful book for the first book swap. 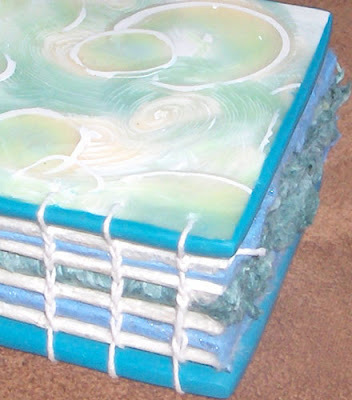 The covers are polymer clay and it is bound using a chain stitch sewing. 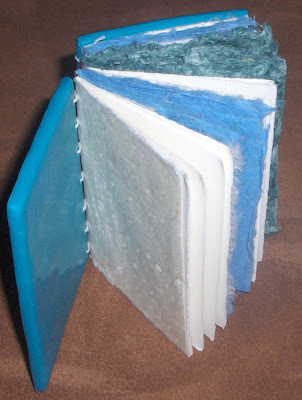 The pages are a combination of Amate paper, heavyweight Mulberry paper, Japanese tissue and some other papers, creating a very pretty book block. Eva described the creation of these pretty polymer clay covers for us. "The main design, kind of a bubble/wave type pattern was made with canes (the different colors of clays were manipulated together to make a log which, when sliced, has a design that you can see on both sides of the slice. Once the canes were made, I took slices and applied them to a white clay sheet and then smoothed it out and cut it into two matching rectangles for the front and back covers. 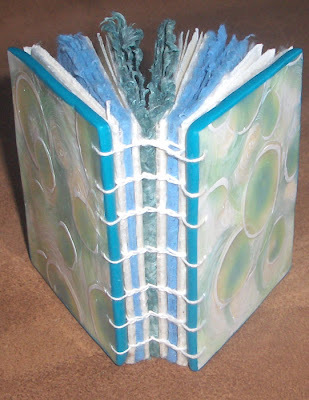 Those design sheets were cured and then I backed with a sheet of turquoise clay, smoothing and rounding the edges. Once cured again, I sanded and buffed to a smooth, glossy sheen." Check Eva's shop at LadyArtisan.Etsy.com to see her other work. 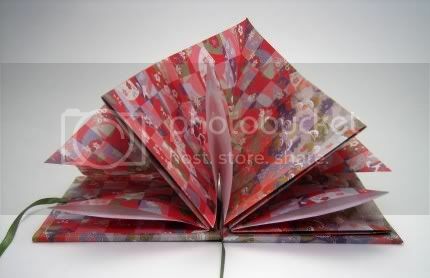 what a gorgeous, precious book!